Backup Storage Tapes: Is the End Nigh? The technology behind storage tape backups has been commercially available since the 1970s. Does it still hold up to modern file archiving demands? 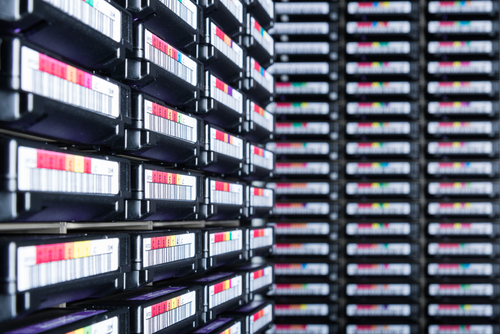 When it comes to questions about storage tape backup, our clients fall into two general categories: those who believe tape is the only truly reliable archiving medium, and those who are surprised tape is still used at all. After all, there are successful millennial business owners today who barely remember their parents selling the family VHS library at a yard sale, let alone the cassette-era. At scale, magnetic tape backup remains one of the cheapest and most-reliable means of long term storage out there, but it also has a number of flaws and limitations that will soon bring the tape era to a close. Network World recently wrote an excellent overview of why tape use is declining, and it’s well-worth reading in full. The short version is that the usual explanations for why storage tape backup is becoming outmoded are wrong. They’re comparable to disk and cloud options in terms of efficiency, and its ability to hold data without degradation for as long as 20 years with proper upkeep remains impressive. No, the problem is that the very way we approach backups has changed. 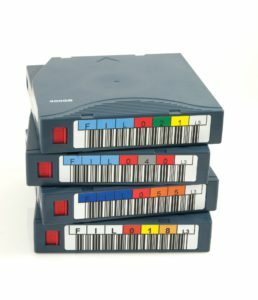 Storage tape was popularized at a time when it was common for businesses to perform full daily or weekly backups. Volumes back then were not nearly so large as they are today, and it was also more difficult to keep track of archived data. It was thought to be better to simply back everything up on a single tape for convenience. Today, software like ShareArchiver provides e-Discovery tools that make archived backups fully searchable. As a result, today full backups are relatively rare, with most businesses relying instead on incremental backups. Incremental backups simply copy changes that have been made since the last backup. That means big savings on network use (no more sending your entire backup over the internet every day) and on physical media. It’s also brutal on tape, which wasn’t designed for such use. Okay, so-far so good. The minimum write speed varies from format to format, but modern storage tape backups record at a good enough clip that they can backup vast amounts of data relatively quickly. But how does storage tape handle incremental backups? One of the great things about disk storage is that data replication is easy. De-duplicated file archives are smaller in volume and therefore easier to move digitally. While storage tape backups are limited to their physical location, with disk and cloud options you can make multiple backups anywhere in the world, dramatically reducing the likelihood of disaster at your data center or while your tape is in transit. The popularity of virtual machine snapshots, which we wrote about recently here , reveals another limitation of tape. If you have a number of iterative snapshots of the same information saved to one location, the increases in volume will be limited to the differences between each image. That’s not an option with storage tape backup. With all of that said, if you’re still loyal to tape you may have good reason—the format is not completely outmoded, and still has its benefits. Here are some tips to make sure your backup storage tape stays in top-condition. Most people know that exposure to magnetic fields can wipe data from tapes, but how often does the average businessperson encounter magnetism of that intensity? Well, the airport for one. If you’re flying with tape, you usually don’t need to worry about walk-through metal detectors or x-ray scanners, but some luggage screening devices can harm tape, as can hand-held metal detectors! Store and handle tape in a clean, dust-free environment. Ideally, it should be free from dirt, dust, cigarette smoke or ash, corrosive gas or pollutants including traffic fumes, and food. Avoid getting fingerprints on the tape. Avoid dropping it or rough handling. If shocks and jolts are expected (e.g. during transport) mitigate by wrapping the tape in protective material, such as bubble-wrap. Store far from direct sunlight or heat and away from electrical equipment or machinery. Most recommendations advise that tape is stored between 65-70° F (or 18-21° C), and at a humidity of around 40-50%. The best way to store tape is standing on its end rather than lying flat. Properly wound tape is generally more resistant to damage. Tape tends to be most vulnerable to harm during transportation or handling, so try and minimize both. The file archiving solution we offer aims to improve on the vulnerabilities of tape so that your data is less susceptible to loss. Features offered by ShareArchiver include real-time replication across different geographical locations to ensure your data is secure. Most importantly, ShareArchiver eliminates the need to handle and transport tape.